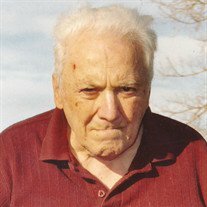 Charles L. Comer, age 90, of Warsaw, MN, passed away Saturday, September 29, 2018 at his home. Charles Louis Comer "Charlie" was born on April 11, 1928 in Minneapolis, Minnesota. Charlie enjoyed gardening, camping, fishing and being the house "Watchman". He enjoyed hanging out in his favorite chair looking out for those that came and enjoying the great Southern Minnesota birds. He would always greet you with a gentleman's handshake and will be missed by his friends and family. Since moving to the Ableman home in 1998, some staff had the opportunity to have worked with Charlie for the entire 20 years. Charley recently celebrated his 90th birthday with his housemates and friends over Wednesday morning coffee hour. A Celebration of Life Memorial will be held at the Ableman home, 23450 Falls Ave., Warsaw, on Friday October 5, 2018 from 10:00 a.m. to 12:00 p.m.